Lawrence Joseph Ellison was born on 17 August 1944, in Manhattan, New York City USA, to an unmarried Jewish-American mother and Italian-American father. Larry is an entrepreneur as well as an investor, perhaps best known for co-founding the multinational computer technology corporation Oracle in 1977 with Bob Miner and Ed Oates. So just how rich is Larry Ellison? Actually he is ranked fifth richest in the United States and seventh in the world on the list compiled by “Forbes” magazine as of late 2017. According to sources, in 2014 alone Larry earned compensations from Oracle which amounted to almost$2 billion, and his total net worth is now estimated at over $60 billion, which he has accumulated through his business ventures. As a billionaire, Larry Ellison has various assets, numerous properties in Malibu including his own home valued at $37 million, and his Lake Tahoe Estate, which cost him $20.3 million, as well as a house in Rhode Island, which cost $10.5 million. Ellison studied at Eugene Field Elementary School, and later continued his studies at the Roger C. Sullivan High School. Upon his graduation, he enrolled in the University of Illinois, but dropped-out after two years, briefly taking courses at the University of Chicago, but failing to finish them also. One of his first jobs was at an information technology company called Amdahl Corporation, founded by Gene Amdahl, which he left in order to join an electronics company called Ampex Corporation, where he began developing the Oracle project – initially, Oracle was developed as a database for the Central Intelligence Agency (CIA). Inspired by his project, Ellison founded his own company entitled Software Development Laboratories, which changed its name during the years until it became known as Oracle Systems Corporation. Ellison served as the CEO of the company from its foundation, until he stepped down from the position in 2014, and instead became the chief technology officer (CTO). Considered to be one of the largest software makers, Oracle Corporation produces and develops database technologies, such as Berkeley DB and MySQL, middleware software products, and various business applications. In 2010, Oracle Corporation acquired the Sun Microsystems company, which specialized in computer services – the cost of the purchase amounted to $7 billion. 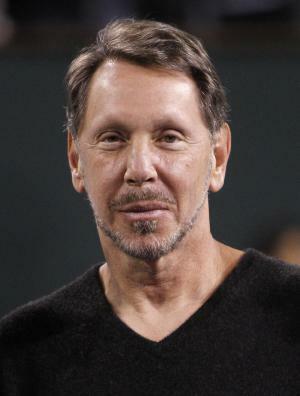 Currently, Larry Ellison serves as the CTO and chairman of the company, of which Jeff Henley is the chairman, while Safra Catz and Mark Hurd – hired after he was fired from Hewlett-Packard – serve as co-CEOs. Aside from Oracle Corporation, Ellison has purchased stakes in various other companies, including the biotechnology company called Astex Therapeutics, a global cloud computing company Salesforce.com, and a software company called NetSuite. In something completely different, in 2010 Larry Ellison appeared in a minor role in Jon Favreau’s superhero film “Iron Man 2” with Robert Downey Jr and Gwyneth Paltrow. In his personal life, Larry Ellison has been married four times. firstly to Adda Quinn(1967-74). His second wife was Nancy Wheeler Jenkins(1977-1978) – they married six months before Ellison founded Software Development Laboratories, but on divorce Wheeler gave up any claim on her husband’s company for $500. He was married to Barbara Boothe from 1983 to ’86; they had two children, David and Megan, who are film producers at Skydance Productions and Annapurna Pictures, respectively. Lastly as far as is known was Melanie Craft, a romance novelist, from 2003 – at his Woodside estate with Ellison’s late friend Steve Jobs, former CEO and co-founder of Apple, Inc the official wedding photographer – and Representative Tom Lantos officiated. They divorced in 2010. Larry is renowned as the owner of several exotic automobiles, including a McLaren F1 and Audi R8, but apparently his favorite is the Acura NSX. Ellison also owns a Lexus LFA and a Lexus LS600hL. 1 Father of film producers David Ellison and Megan Ellison. 2 In 2004, Forbes reported his net worth at around $13.7 billion, making him one of the 10 richest people in the U.S.
3 In 1977, with $2000, he founded the company Software Development Laboratories. It was later renamed Oracle after the flagship product Oracle database. 4 Dropped out of University of Chicago. He had an early aptitude for mathematics, and worked for Ampex Corporation. One of his projects was a database for the CIA, which he named "Oracle". 5 He was born out of wedlock to a 19-year-old girl, and was raised by her aunt.